Don’t Panic Wedding Series: Yes, Your’re Engaged! What’s Next? Huge congratulations, you said yes! Take some time and enjoy this mammoth moment! First off go get yourself a killer manicure and of course that that must have ring selfie, this is a moment where you allowed to shamelessly insta story your ring! Call your friends and family to gush about the news or throw a surprise engagement party. Binge watch "Say Yes to the Dress episodes" while scrolling through a bunch of wedding blogs and of course create a pinterest board. Then slowly, we mean slowly get down to business and plan the wedding of your dreams. 1. BRAINSTORM & DISCUSS. Sit down with your fiancé (do you still have a big cheesy grin on your face when you say that word, oh we know you do) and discuss your ideal wedding day. What time of year do you each love? Are there particular venues that have a special place in your hearts, such as the place you first met or the location of your first date? What are each of your must haves? This is the first moment that you both need to promise each other that this is your day and it will be your way. Be realistic and be clear on what is important to you. 2. SET A BUDGET. We know it’s likely this is going to be one of the biggest milestones in the planning process but do it early. Decide how much you and your fiancé will personally be spending on the wedding and figure out whether or not your families will contribute. Figure out your ideal budget to decide if you can afford to hire a planner. If you’re able to afford a planner, your planner has the skills and expertise to help you fine-tune your budget and decipher how much your must-haves will cost. Your planner will then do the math (see this is why you already need one) to establish your remaining budget and allocate the funds accordingly. 3. HIRE A PLANNER. Admit it – you’ve always wanted your own personal superhero, best friend. A wedding planner is a superhero come best friend in heels (well most of the time, I would like to say I look like Jennifer Lopez from The Wedding Planner every day, but sadly I don’t). If your budget allows, hiring a wedding planner can be a huge life saver! There’s a lot that goes on behind the scenes of wedding planning and execution that brides don’t know about. A planner can suggest reputable suppliers, such as photographers and florists, that will help bring your dream wedding to life. 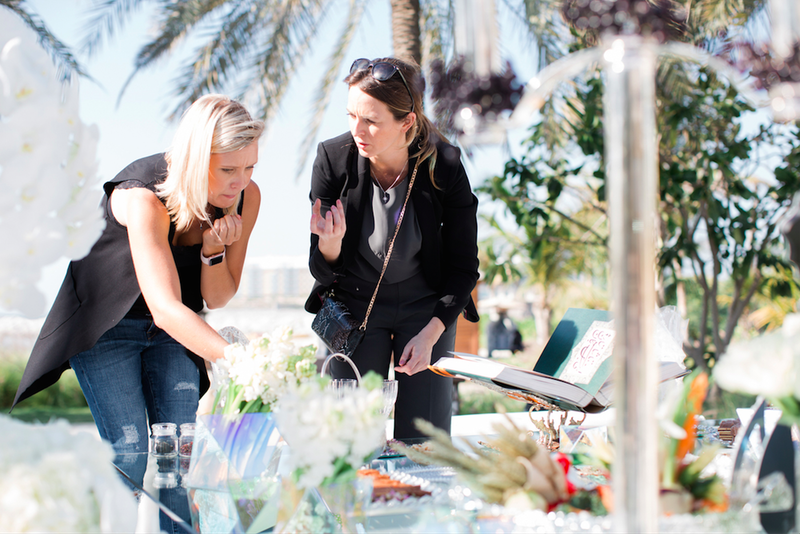 Wedding planners rope in all the details and ask all the questions that you may not think or know to ask. Furthermore your planner will help you see the bigger picture. 4. DRAFT THE GUEST LIST. These days the guest list is a very different ball game, if you and your fiancé are paying for your wedding then there will be more of your friends. Ask your parents for their ideal guest list, preferably having them prioritise their guests in order of “must be there or else…” to “would like to have attend, but we won’t disown you if they don’t get an invite”. List your ideal guest list and have your fiancé do the same. Cross reference the guests on your lists with your parents’ and estimate how many people total. Although the list does not have to be set in stone in the early stages of wedding planning, having a rough estimate will give you a good starting point when looking at venues and setting the budget, eg: number of tables. 5. BOOK YOUR VENUE. The venue is the canvas for your wedding. It will influence almost every aspect of your wedding, from the background in your pictures and the guest list, down to the colour of your table linens and floral. Pick a place that will fit the design and feel that want. Do you want a beach or desert wedding, silver service dinner or buffet? Schedule visits to possible venues and go with a list of questions, and then book early! Some venues in Dubai wont allow you to book more then 6 months before, but this will then give you a good idea of which ones you would choose. 6. SET A DATE. One of the first questions you’ll get asked as a newly engaged couple is “When’s the big day? !” While the date seems like something you have to nail down first, don’t! The main reason we suggest not nailing down the big day earlier on our list is what if you fall in love with a venue, but your date isn’t available? Firstly pick a time of year you’re thinking about getting hitched and then visit venues, making sure to get a calendar of their availability. In the meantime, try and think of at least the time of year, as many of your guests are travelling to your wedding, they will want to know dates to start planning and of course saving. Try and at least send out, Save the Date cards to friends and family so they can all plan accordingly to be there for the big event. 7. GO DRESS SHOPPING. Let’s admit it: this will probably be the most fun to-do item on your list. Do some serious online browsing and screenshot any dress styles that speak to you. Familiarise yourself with necklines, silhouettes, and fabrics. Also, take into consideration the time of year and location of your wedding. Are you planning a beach wedding during the summer months? Go with a lightweight, flowing fabric. The best advice we can give you, is go with an open mind to your first trial, as what you think may fit your body type may not at all. Try on different styles and material and then start the big hunt! Of course make sure you take some bubbles and your girls. 8. BOOK KEY PLAYERS. Photographers and videographers get snatched up quickly, so book them quickly! Secondly, your entertainment and then your florist. You don’t need to know exactly what style and flowers you want at this point. Just ask your favourite florist to reserve the date for you. 9. ENJOY THE PROCESS! Your engagement is a special time in both of your lives. Revel in your happiness and share it with loved ones. But most of all, make sure the two of you stay connected, take time to laugh, and remind each other why you’re choosing each other in the first place. ← Don't Panic Wedding Series: Can't Afford Flower Centrepieces.... Now What?